O. arenaria is a small prickly pear that occurs in the greater El Paso region from adjacent New Mexico to near McNary, Texas in sandy or silty soils where they form low, creeping cactus mats often 1-3 m in diameter. It is described as a variety of O. polyacantha in the Flora of North America. However, we regard this cactus as a stand-alone species of prickly pear. Often some branches of this Opuntia are buried by shifting soil and these have been interpreted by some to be rhizomes. The pads are small and narrow, 4-7(-10) cm long and 2-3(-5) cm wide and 2-3 cm thick. This Opuntia produces spines in all but the lowermost areoles, but the spines do not cover the glaucous or light green stem segments. Areoles may have 5-10 spines with one much longer than the others. The largest and flattest pads of O. arenaria may resemble the pads of O. polyacantha in overall aspect. 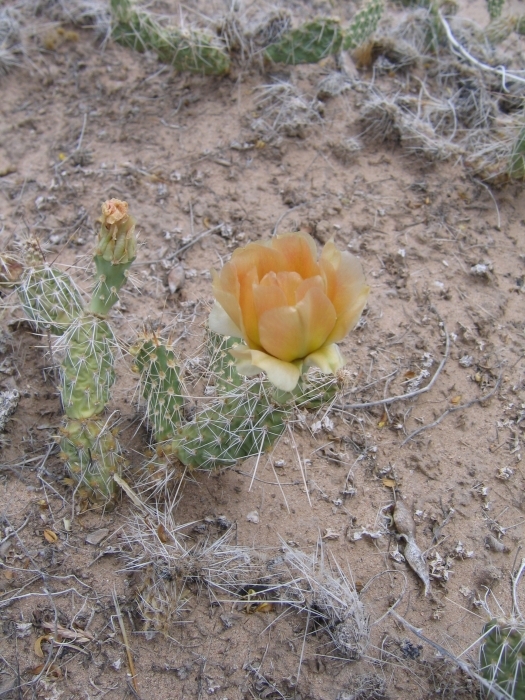 The yellow flowers of this prickly pear are 4-6.4 cm long and 4-6 cm wide. The filaments are white or pale tinged with pink, anthers are 1.5 mm long and yellow. The style is while or pale green, 1.2 to 2 cm long. The stigma lobes are about 2 mm long and green. The pericarp is slender, perhaps 2 or 3 times as long as thick. The fruits are reddish and then tan and dry at maturity in this Opuntia. Fruit areoles may have 3-6 spines that are 6-9 mm long. The fruit is narrowly obovate-obconic, constricted below the apex, 2.5-3 cm long and 0.9-1.2 cm in diameter. The umbilicus is deep. Seeds are tan and shiny, irregularly discoid, and large—up to 6.5 mm in diameter. The have a 1-2 mm margin. O. arenaria habitat is being destroyed by development, dumping, and off-road driving, etc. See the original citation. O. arenaria is diploid. This prickly pear species is closely akin to other dry-fruited species of Opuntia, but due to its low chromosome number and morphological stability, it is usually considered to be a distinct and well-defined species. O. polyacantha (incl. O. erinacea) may be separated by the larger Opuntia (i.e., polyacantha) because the pads in O. polyacantha are usually well over 3 cm in diameter, as well as the fact that individuals of that taxon may have pink, red, or magenta pigmentation in their flowers. Opuntia polyacantha is tetraploid (2n = 44), whereas O. arenaria is diploid (2n = 22). The two Opuntias are not known to occur sympatrically.